Although the blanket or shuka was the original inspiration for my Maasai ensemble, it is the blouse that took the longest to make! This is a longer post, but considering the months that went into making this top... I want it to get the credit it deserves! As I talked about in my overview post, I didn't want to make just a plain colored blouse to go with the skirt. Those are a dime a dozen, and I was afraid that the look would come off as too Scottish because plaid is more readily attributed to Europeans than Africans. I wanted something in the blouse to seal the look as African-inspired. 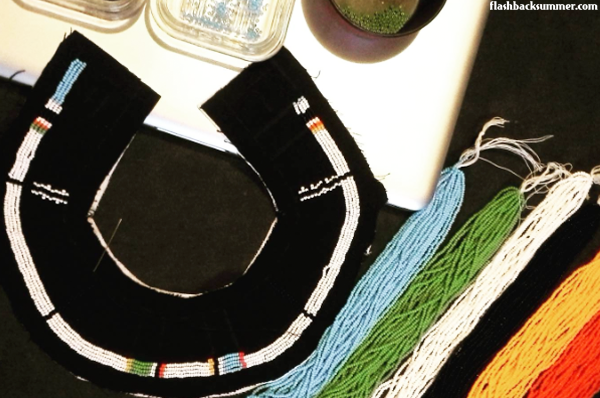 While shuka are commonly identified with the Maasai while in Africa, their beaded jewelry is connected to them worldwide. Their large, collar-style necklace, stacks of bracelets, and bright colors are unique to their aesthetic. I wanted to incorporate this into the top so it would scream MAASAI when I wore it. However, I also didn't want it to look like a costume. I happen to own one of the beaded collars I bought in Kenya, but it looks out of place in my midwestern U.S. context and borders on costumey or, at the very least, "trying way too hard" because of its large size and very long beaded strings that hang down the front. I wanted to incorporate beading in a more scaled-back way. Tying in my love of Western 1940s looks would be a plus! I waited and waited, but no design for the top ever felt quite right... until I stumbled across this pattern, Hollywood 1165! Someone gave it to me, and I made up version three for a work shirt. 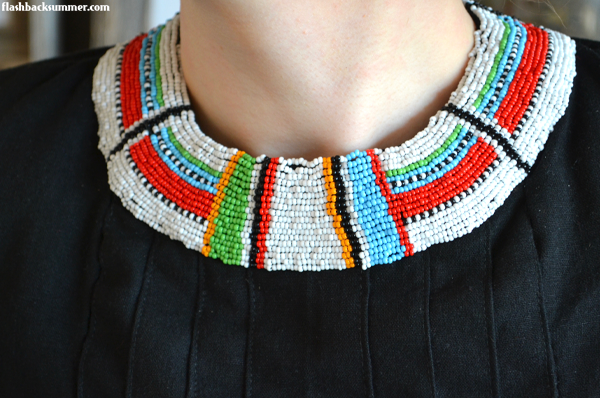 It dawned on me that the circular yoke around the neckline would be a perfect shape to mimic a Maasai collar-necklace. I happened to have some drapey black wool in my stash, so I cut out a collar piece, interfaced it, and got to work on the beading! Now for any of you that actually do beading... I'm obviously not an experienced beader. This was my first attempt at such dense beading, and while it is by no means perfect, I'm pretty happy with it. I have had these tiny, tiny seed beads in my stash for several years. I bought them in the Omdurman bead market when I was living in Sudan, and they've been waiting in a bag ever since. While many Maasai pieces created for women involve more orange and bright yellow beads, I worked with the colors I already had and arranged them in a way that would make them pop most against the black blouse. Quite honestly, if I ever had the opportunity and resources to make such clothing again, I'd much rather collaborate with a Maasai woman to do this part. They're just so much better at it! I didn't directly copy any Maasai jewelry that I saw because I don't want to rip off anyone's work or pretend this was made by a Maasai artisan. I did try to stay true to their aesthetic, though, and I based it off of one of the simpler necklace motifs I found in my research. It is important to note, however, that there are meanings behind motifs and even the type of jewelry piece. Each item tells a story about the wearer. Once the collar was done, I began construction on the rest of the blouse. 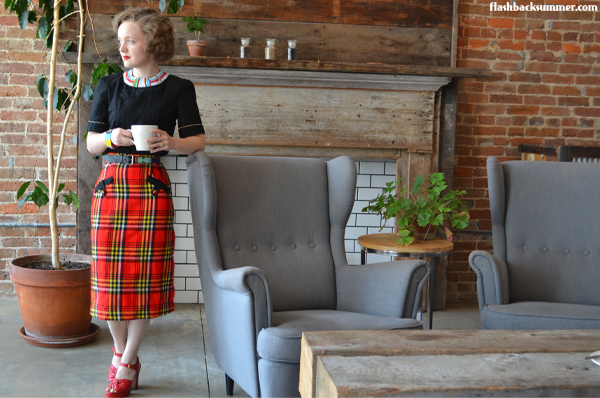 I chose a view with pleats down the front to keep a streamlined silhouette while connecting the colorful parts of the outfit, the neck yoke and pencil skirt. I foolishly thought this view would be similar in sizing to the work shirt I created... and I was very wrong. While the back of the blouse fit well, the front was weirdly about 4-5" too baggy, and the yoke and pleat sections didn't fit together well. I had already cut it out of my fashion fabric, so I made it work but removing excess at the side front pieces and hand sewing many parts together to be sure they fit just right. It was a long, frustrating process, but I'm quite happy with the results! I also chose to add a cuff to the sleeves instead of turning the hems under, and I added a string of randomly arranged seed beads around them. I didn't want to lose the cuff detail in the dark fabric, and it lines up with a Maasai aesthetic principle that "more is more!" 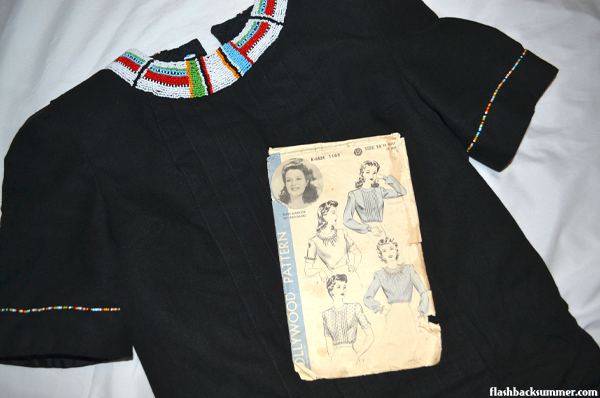 I lined the entire blouse in a black bemberg rayon. After all that work, I wanted the inside to look as good as the outside. It covers the seam allowances and shoulder pads and will increase its longevity when worn. It also prevents the wool from touching my sensitive skin. Obviously, I couldn't let all the pretty stuff of the blouse be on the front and leave the back neglected. The pattern had a fantastic button-up back detail, and I jumped on this to add some visual interest. However, I also wanted the buttons and buttonholes to match the couture quality of the rest of the blouse. Machine-sewn button holes would look cheap compared to everything else, but bound buttonholes would add too much bulk to the back sections which were already quite thick from the facing and lining layers. I decided hand-sewn buttonholes would add a couture touch while still being thin enough to keep everything functional and comfy. I used this tutorial to learn how to do them properly. Many, many buttonholes later... I was loving how it looked! 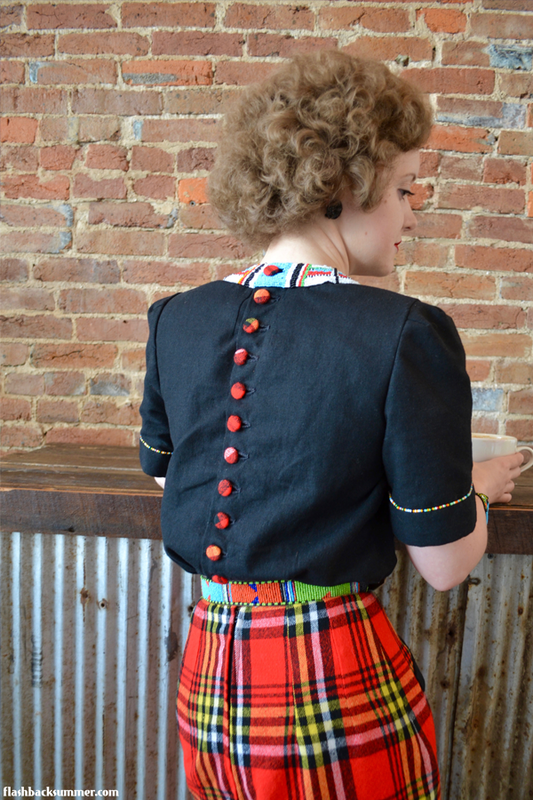 I love the huge amounts of buttons on some vintage pieces, and it's a detail modern clothing doesn't tend to have. As for the buttons themselves, I wanted to tie in the shuka fabric. 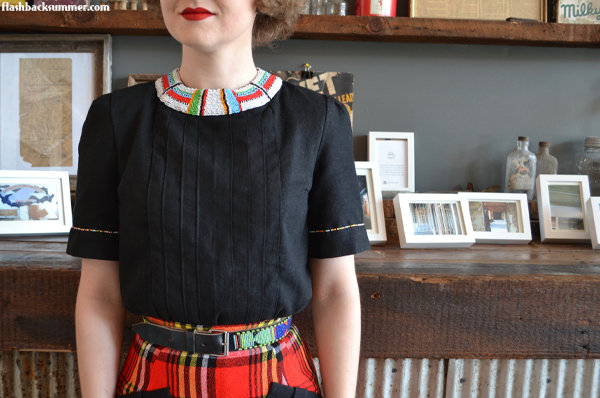 It kept the Maasai theme going on the back and also makes the blouse and skirt look like a matching ensemble instead of mix-and-match separates that kind of "go." I used Dritz 5/8" button kits that I could get at my local sewing store. Honestly, there must be a better option. I interfaced the shuka fabric because of its loose weave, and the thickness of the layers seemed a bit much for the little buttons. Luckily, my husband was able to brute-force them together, though their dome shapes were a bit flattened in the process. You can't really tell when looking at it, so I rolled with it! I love how it all looks together! I'll be able to wear the blouse with other bottoms, and it will always add uniqueness to any look because of all its details. Quality-wise, I'm very proud of the couture-style work and it feels fantastic to wear. The beauty of Maasai jewelry is that it is easily layered over the clothing you already have. Any of these gorgeous pieces in combination with your favorite black blouse will make a big fashion statement! 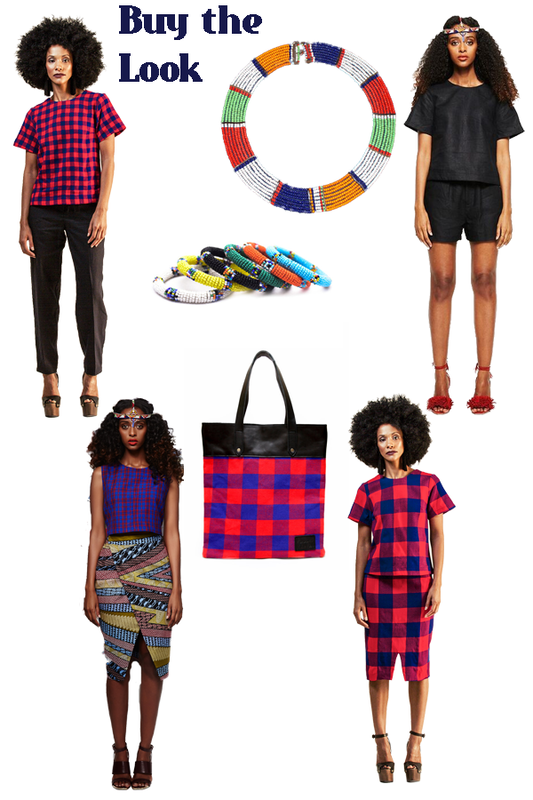 I've also included other kinds of tops that are inspired by the Maasai, in case you'd like a bit of a different look. I just included a sampling; there are many more Maasai-inspired pieces on each site I've linked to! What do you think of the top? How about Maasai jewelry? How would you style it in your own looks, if you feel right doing so? The level of workmanship in this is wonderful. The beading is such a gorgeous touch. From the first look at the outfit, it was a very clear homage to the Maasai culture (my husband spent some time in both Kenya and Tanzania as a teen, so we've looked at pics before). What beautiful beading you did too! I'm so glad we got to get a closer look at the blouse. I didn't know the meaning of the beading, and I'm very excited to learn about it -- thank you for sharing this with us! So lovely! Thank you for sharing your inspiration because it is so neat to see an outfit that has truly special meaning to it. I loved reading those posts and your beading is amazing (so much better than mine). Bravo! You did such an incredible job on every element of this outfit, the beading immensely included. I am seriously doffing my hat to you. This blouse, much like the skirt, is a true work of art that further highlights what a talented seamstress and fashion designer alike you are. Just lovely, Emileigh! I love the way you took something that inspired you, made it vintage, gave such attention to detail, and also put your personal touch into it! Now that's an awesome thing to do with your talents. Also, I have the same blouse pattern as the one you used. I've had my pattern matched with fabric and been wanting to make it since last years' fall (need to get to that)! Did you know that Ruth Warrick was also a Missouri gal? Great review. I smiled when you said you had take out so much from the front - yes, indeed. 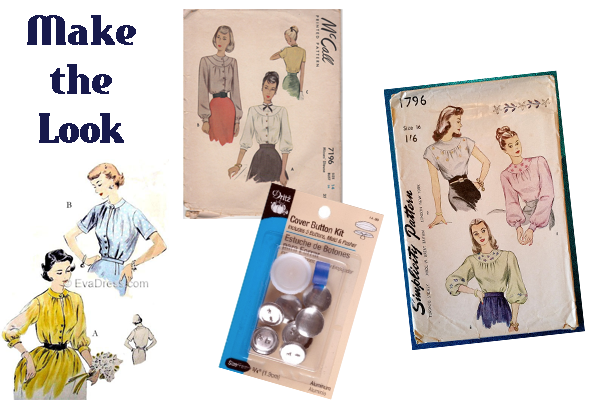 In the last several months, I have been making a number of other company patterns such as Advance, Du Barry, Hollywood, and even New York, and so far they do not fit at all like a Simplicity or McCall or Butterick. Much too much ease, short waists, and extra length...not a predictable fit, something to look out for, but still great patterns. Thank you Kelly! I didn't know Ruth Warrick was a Missouri girl; that's fun to know! And it's so true, the other pattern companies.... I'm just confused sometimes as to what body they're fitting for! Muslins are definitely a must! I remember seeing the "in progress" picture of the collar a while back on instagram, and I was curious as to what it was going to be- this is great! For a first attempt at this beading style, good job! 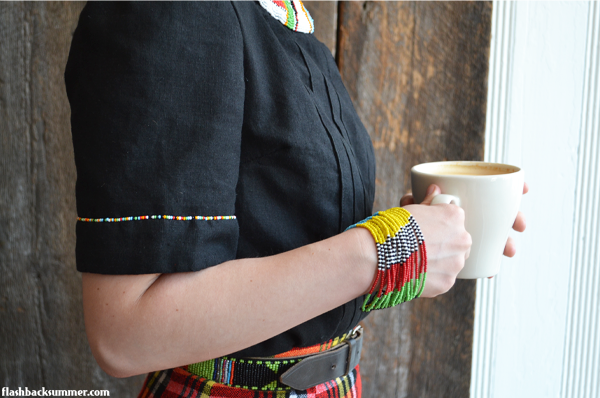 The blouse is so perfectly paired with the skirt, and the whole ensemble is such a great tribute to Maasai style. This is the most beautiful garment and I love all the thought, care and work that you have put into it. It looks wonderful and it must feel very special to wear. The Maasai women, and you, must have so much patience to do all that beading. I am so impressed with your beadwork! Cannot believe that is your first attempt! I have never had the guts to try it, but if I ever do, I can only hope it will turn out as beautiful as yours!! Aw, wow, thank you so much Dana! Beautifully put together (and photographed). Thanks for sharing this!